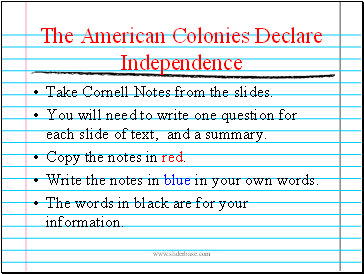 Take Cornell Notes from the slides. You will need to write one question for each slide of text, and a summary. Copy the notes in red. Write the notes in blue in your own words. The words in black are for your information. 1754 to 1763 war fought over the land in America between the English and French. It was called the Seven Years War in Europe. 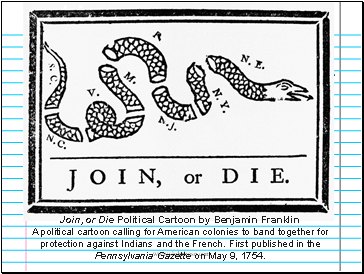 Called the French and Indian War because the Indians helped the French in the war against the British. The Indians had nothing to lose. The British were taking their land, the French were not. The British won, but at a cost a lot of money. Forbid colonists to settle west of the Appalachian Mountains. 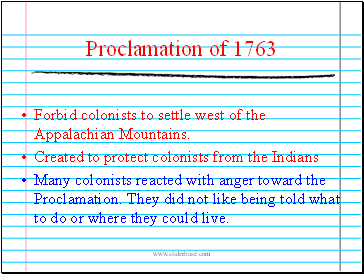 Many colonists reacted with anger toward the Proclamation. They did not like being told what to do or where they could live. 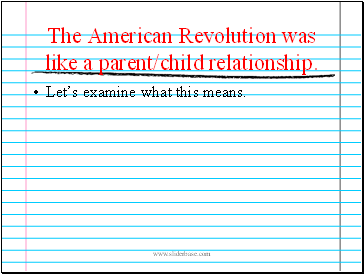 The American Revolution was like a parent/child relationship. Let’s examine what this means. 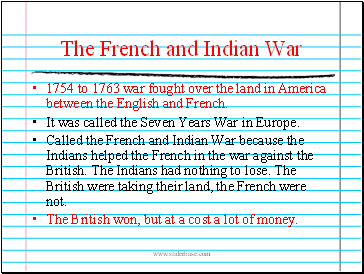 French and Indian War cost a lot of money. Parliament (the British government) decided to tax to colonies to help pay for it. The first tax was the Sugar Act of 1764. It placed a tax on molasses and sugar imported by the colonies. Stamp Act of 1765 placed a tax on all printed material, such as newspapers and playing cards. 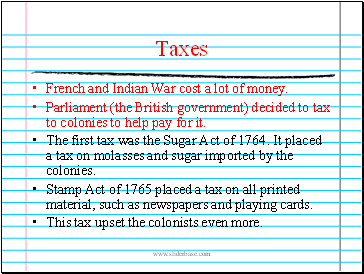 This tax upset the colonists even more. 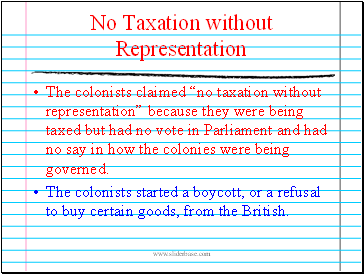 The colonists claimed “no taxation without representation” because they were being taxed but had no vote in Parliament and had no say in how the colonies were being governed. 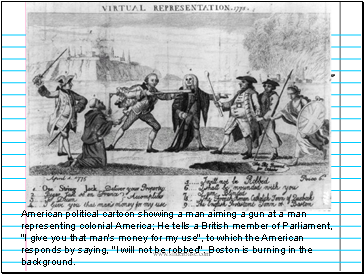 The colonists started a boycott, or a refusal to buy certain goods, from the British.